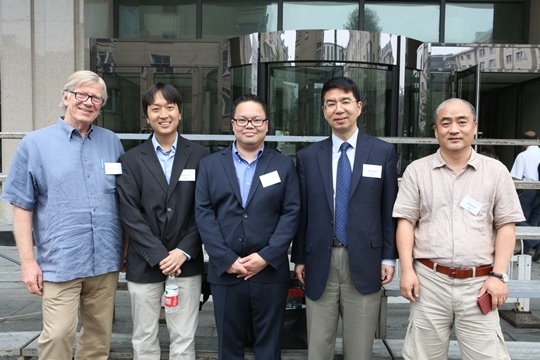 Faculty from left to right include: Nicholas Brecha, William Hsu, Alex Bui, Jason Cong, Ming Jiang during the Sixth Annual PKU-UCLA JRI Symposium, at PKU, 2015. Prof. Ming Jiang, from the Department of Mathematical Science, Dr. Guojie Luo and Dr. Yun Liang from School of Electronics Engineering and Computer Science at Peking University are conducting a joint research proposal titled "High-Performance and Energy-Efficient Computing for Image Reconstruction: Theory, Implementation and Applications", together with Prof. Jason Cong from Department of Computer Science, Prof. Luminita Vese from Department of Mathematics, Prof. Alex Bui and Prof. William Hsu from Department of Radiological Sciences, Prof. Nicholas Brecha from Department of Neurobiology at the University of California, Los Angeles (UCLA). The project investigates the image reconstruction theory, algorithm and energy-efficient architecture for three applications: low-dose x-ray computed tomography, transmission electron tomography and video super-resolution reconstruction. The theory, algorithms and energy-efficient architecture established in the project can be applied to other image and video processing problems. The proposal won RMB 2.5 Million funding from National Natural Science Foundation of China (NSFC) Project of International Cooperation and Exchanges. The Joint Research Institute (JRI) in Science and Engineering between Peking University (PKU) and the University of California, Los Angeles (UCLA) was established in 2009 with the goals of promoting joint collaborative research, facilitating student exchanges and the technology transfer of collaboration results.